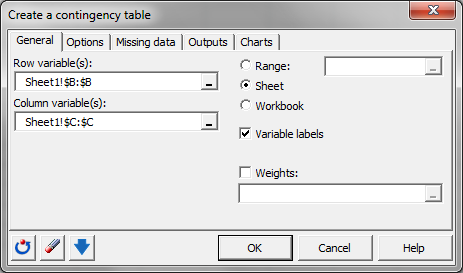 This tutorial shows how to create a cross-tab, also called contingency table from two qualitative variables in Excel using the XLSTAT software. The dataset contains information on 20 clients: their age, city of residence and gender. We will create a contingency table on the Age and City variables. 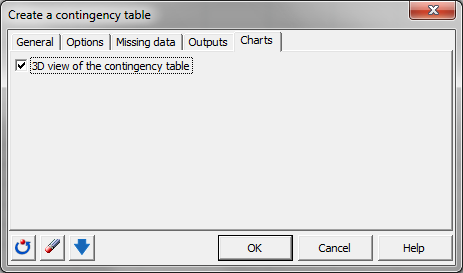 After opening XLSTAT, select the XLSTAT / Preparing data / Create a contingency table command. In the General tab, select the category variable you wish to use in rows. Select the Age variable by selecting the entire column. Then select the variable to be used in columns. Here we choose the City variable. The output should be displayed in a new sheet so tick the option Sheet. The columns B and C contain variable labels so the option Variable labels should be ticked. In the Options tab, you can decide how the categories of the variable should be treated. Also you can choose to run a Chi-square test. In this case, however, we will only select the Sort the categories alphabetically option. 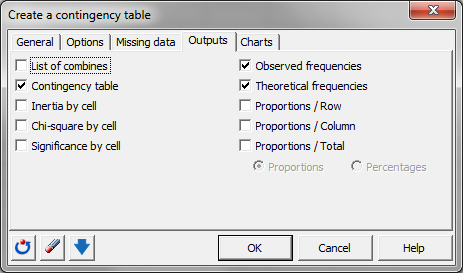 In the Outputs tab, select the Contingency table as well as the observed and theoritical frequencies. 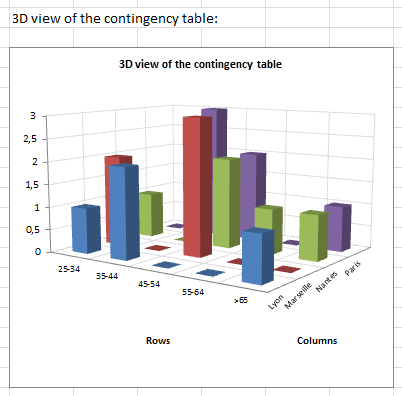 Select the 3D view of the contingency table in the tab Charts. The first result is the contingency table. Notice that there isn't a client in all crossed categories. For example thre is no client in Paris aged 25-34. The next result is the 3-D plot, which is a good visualization of the data distribution. 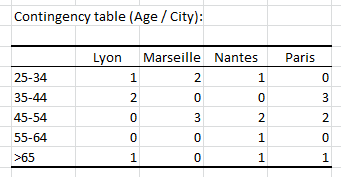 Next are the two tables containing the frequencies Age/City. You can compare the actual distribution of the clients and the theoritical distribution if the distribution was random. It is possible to test if the two qualitative variables that shape the contingency table are independent. 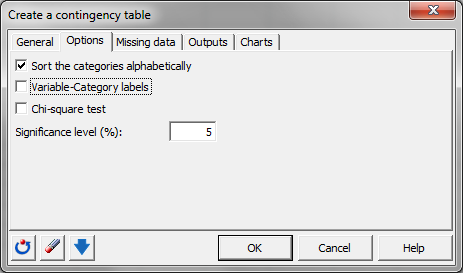 XLSTAT is able to automatically output test results on the contingency tables. You can enter as many qualitative variables as you want in both the row and column variable fields in XLSTAT. XLSTAT will produce one result for each possible pair of row/column variables.